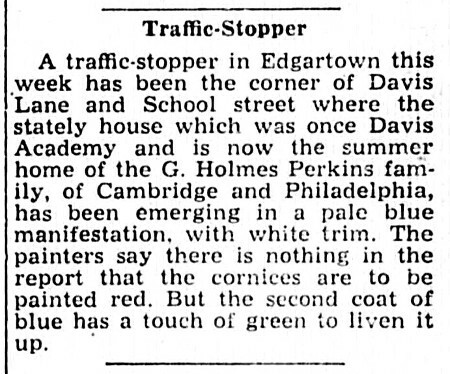 A traffic-stopper in Edgartown this week has been the corner of Davis Lane and School street where the stately house which was once Davis Academy and is now the summer home of the G. Holmes Perkins family, of Cambridge and Philadelphia, has been emerging in a pale blue manifestation, with white trim. The painters say there is nothing in the report that the cornices are to be painted red. But the second coat of blue has a touch of green to liven it up.